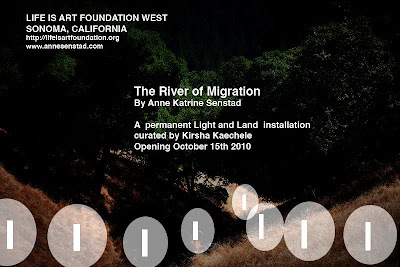 The inaugural exhibition opening of the land art foundation, Life is Art Foundation West in Sonoma, CA, Oct 15th 2010 will include 10 international artists. 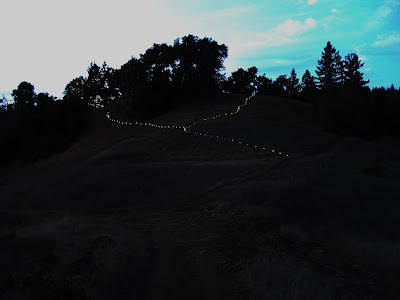 The River of Migration, consists of 72 solar power run lights, that are placed on a mountainside in a long consecutive line, creating a light contour of the landscape. The representational land and light piece creates a spatially drawn line and a geographical mapping of the Californian landscape, as well as a gesture to the politics of migration. The intention of light, represents a river of light and a human river of the nameless. The lights are placed as a gesture to those who failed to cross the US-Mexican boarder, or have been murdered in the process. This permanent installation brings attention to the current US boarder politics, the erection of the boarder wall towards Mexico, the fact that California was once Mexican/native American, the violent deaths of people attempting to cross the boarder, as in the murder of the 72 individuals from various Central and South American countries who resisted being used as drug traffickers in 2010. As the solar panel lights are lit from dusk till dawn, when most people cross the boarders illegally, that physical practicality will serve to establish the phenomena of non-governmentally controlled migration. 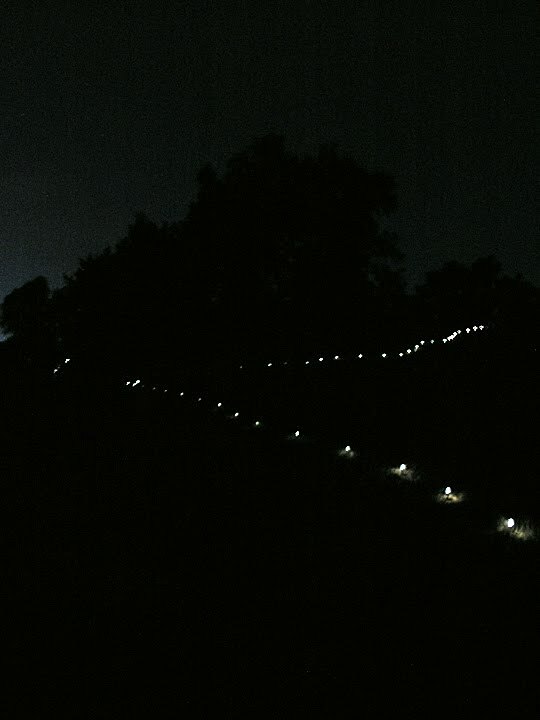 The notion of a long line of lights down a hillside, talks about the nature of migration, how bodies of peoples crossing long distances, will naturally walk in a sequential manner according to age, physical health, group importance and their task within the group. The phenomena of artificial lights in a natural untouched landscape, talks about the notion of light and darkness, nature and the artificial, the environment and the untouched landscape providing a scenario for interaction and intention. The use of solar power lights emphasizes environmental and sustainable concerns by using light to create light. The London Art Book Fair 2010 will take place at the Whitechapel Gallery from 11am on the 24-26 September 2010.The London Art Book Fair is an annual event devoted to international art publishing. Hosted by the Whitechapel Gallery in association with Marcus Campbell Art Books, The London Art Book Fair presents the work of individual artist publishers, galleries, magazines, colleges, arts publishing houses, rare book dealers and distributors alongside a wider associated programme of talks and events. Exhibitors have been selected by an advisory board comprisingMarcus Campbell (rare book dealer); Tacita Dean (artist);Franz König (publisher & bookseller); Farshid Mousavi (Co-founder, Foreign Office Architects); and Soraya Rodriguez(Director, Zoo Art Fair) who have ensured that the fair includes representatives of the most vibrant, stimulating and diverse art book production. 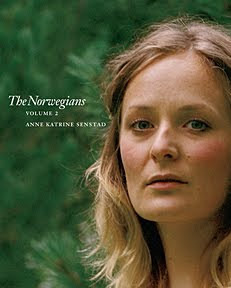 The fair will include a special preview on Thursday 23 September 2010 for booksellers, distributors, collectors, and the arts and literary press.